With the rising cost of electricity, off grid solar systems are becoming more and more popular with home and business owners, including farmers in rural areas because they’re given the freedom to completely fire the electric company and live without a monthly electric bill, increased “service charges” and generate their own never-ending clean energy. 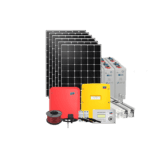 If you want to get rid of the electric company entirely, or live where the power lines just don’t come, an off grid solar system is the right choice when going solar. If you have questions about what type of solar power system is right for you, please contact us or call one of our solar professionals today at +44 333 772 0526. 0Bills also offer up a 10 year component warranty on the Components. By using ZEROhomebills as your innovative solar solution, you can benefits from our warranty!